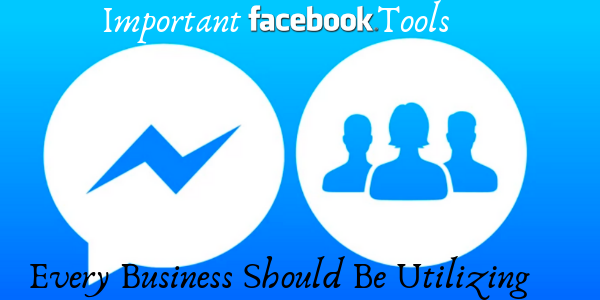 When a business creates a presence on Facebook they go through the steps of setting up a business page, optimizing their timeline graphic and avatar and put in a description. Once that is complete most businesses think it just about creating content for that page with the hopes that people will engage with you on there. In reality, that is just the bare bones of how a business should utilize the world’s biggest social network. In the past few months, there have been many more opportunities that are now available to businesses, both on the organic and paid side. Two of the biggest are Groups and Messenger. Groups are not something new; they have been around for a while. Now though you are able to post to a group as a business, not just a person. This is huge as for one groups get a lot more free engagement than pages do and second groups already have a slew of members in it that are already interested in what you are selling. By posting as your business to a specific, relevant group can bring a lot of new relevant eyeballs learning about your brand quickly and for free! Messenger has also expanded its capabilities in the past for years and one way to really utilize it effectively is when boosting posts. When you boost a post on Facebook you are given the option to add a clickable link to your website or landing page. Instead of doing that though, you can create a button that leads prospects to a customizable welcome message in Messenger, which creates a 1-on-1 conversation with potential prospects. This is an excellent opportunity to be able to instantly answer questions in a private setting and getting personal information such as email and phone number so the conversation can easily be continued in the future. As a business the opportunities are just getting bigger on Facebook. The more utilize them properly the higher the potential of new business you can achieve. For more information on these tactics and others contact The Interactive Imprint at 954-254-1650 or visit TheInteractiveImprint.com.